Kaolin, which is also known as "china clay," is a white, alumina-silicate used in making paper, plastics, rubber, paints and many other products. Kaolin deposits in middle Georgia resulted from the erosion of deeply weathered crystalline rocks in the Piedmont Plateau, which were deposited along Georgia’s Fall Line. 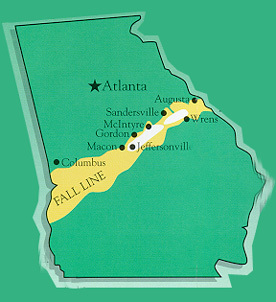 This occurred between 50 and 100 million years ago during the Cretaceous and Tertiary geological time periods, a time when the waters of the Atlantic Ocean covered much of Georgia’s Coastal Plain. The industry produced approximately 7.6 million finished tons of kaolin in 1992. 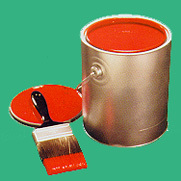 Almost 80 percent of the kaolin produced in Georgia is used in filling and coating: fine publication papers, light-weight catalog papers, and consumer product packaging. Over the last three decades, kaolin products have been tailored for paper applications ranging from low-cost pulp extenders to high-opacity fillers and high-gloss and high-brightness coatings. Also, kaolin is a key ingredient in mildew-resistant latex paints, vinyl wire insulation, printing inks, cosmetics, rubber tires, fiberglass and nylon, and auto and truck body components. Today, other applications for china clay are continually being discovered. Kaolin is used in the production of medicines, ceramics, catalysts for petroleum refining, and extenders for fertilizers, pesticides, and herbicides. More than 4,400 Georgians are employed in the mining and processing of kaolin, making kaolin the state’s most important mineral industry - with direct payroll and employee benefits exceeding $232 million annually. Additionally, in 1992, $103 million was paid to hundreds of other Georgians who work in businesses serving the kaolin industry. The kaolin industry provides steady employment for a largely rural part of middle Georgia. 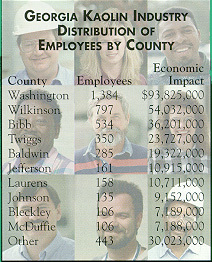 This employment affects many counties, helping hundreds of local businesses. In addition, the export activities of the industry are a major source of revenue for Georgia’s Port of Savannah. 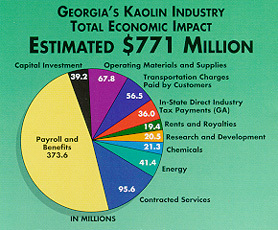 The overall economic impact of the kaolin industry on Georgia is estimated at $771 million in 1992. This figure includes payroll, employee benefits, capital investment, contract services, energy, chemicals, operating materials and supplies, research and development, rents and royalties, and taxes. Georgia’s kaolin producers generate approximately $120 million each year in local, state and federal taxes. Economists estimate that the total payroll effect exceeds $470 million annually as payroll dollars are spent and recirculated in communities in middle Georgia and throughout the state. After the kaolin is removed, the land is carefully reclaimed and restored by contouring and grading the surfaces to blend with the surrounding terrain. Reclaimed lands are suitable for a wide variety of uses including agriculture, forest production and wildlife. Since 1969, 80 percent of all lands mined have been reclaimed or are in the process of being reclaimed. It is estimated that 3,700 acres are currently involved in active mining. The kaolin industry is planning and investing in its future. Each year millions of dollars are spent on research to develop new products and new processing technology. In 1992, the industry reported total capital investment for the production of kaolin to be approximately $1.5 billion. During the past five years, $522 million was invested in plants and equipment. By continuing to invest in Georgia, the kaolin industry is working to maintain its leadership role in developing new kaolin-based products for worldwide markets. While the industry is competing daily with foreign producers and substitute mineral products, it is dedicated to maintaining its present markets and developing new ones. The kaolin industry makes safety a priority, spending more than $3.5 million on safety education and accident prevention programs a year. The accident rate involving lost work days is extremely low - 1.58 accidents per 100 employees in 1992. The Mine, Safety & Health Administration (MSHA) has singled out the kaolin industry as having one of the best mine safety records in the country.